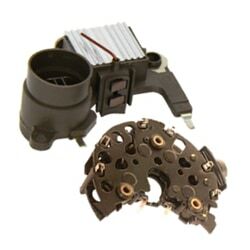 Regulators and rectifiers under the MESSMER brand complete the range of rotating electrics spare parts. They are located inside the alternator and allow it to work properly. The alternating current is converted into DC through a diode rectifier, while the voltage value is kept constant by the voltage regulator. High quality products, they can be fitted on European and Asian vehicles. Company subject to management and coordination by LKQ Italy S.r.l.